Today is World Book Day here in the UK but unfortunately a lot of schools are closed due to heavy snow fall so I guess it is being celebrated at homes around the UK instead as costumes will have been made or bought. So Happy Chilly World Book Day! Inspired by this yearly event I have put together a collect of fantastic ideas for a book themed wedding for all you Bibliophile Brides. 1. A beautiful stack of pastel coloured vintage books with a pretty posy of roses and greenery bursting from between the pages. Inspiration from Put A Ring On It. 2. 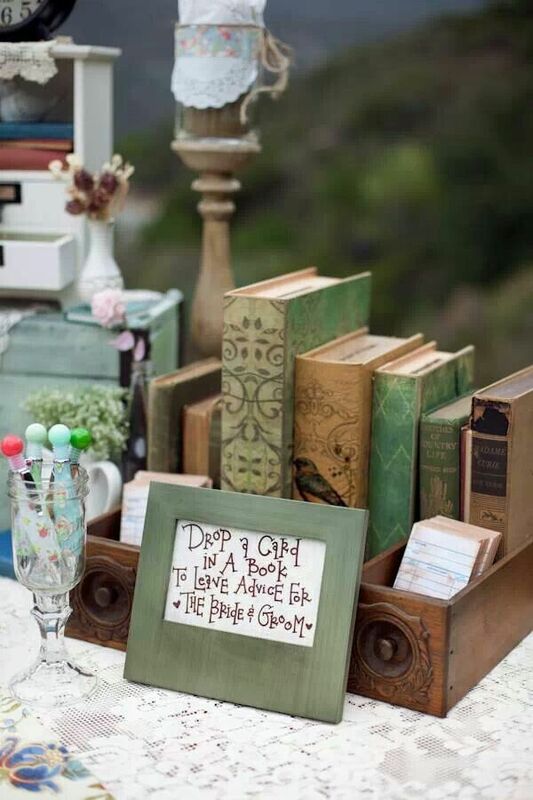 A lovely library themed way to collate well wishes from guests inspiration can be found here. 3. Vintage book pages hand rolled into confetti cones. Handmade to order by Song Bird B Designs on Etsy. 4. A stunning book page backdrop perfect for photo ops or for behind your cake table. Inspiration from Make It Franke. 5. A delicious and opulent wedding cake created to look like a pile of antique books, almost looks to good to eat! Handmade by Galatia. 6. Library card themed place cards handmade to order by In Focus Designs on Etsy. 7. A handmade paper wedding bouquet. Each individual flower is made of hand cut petals from vintage and aged book pages. The bouquet has been further embellish with frayed flowers, so gorgeous! Handmade to order by Heart Of Heidi on Etsy. 8. A unique wedding Save The Date Card styled like a library card. Handmade to order by Wedding Monograms on Etsy. 9. Pretty heart hanging decoration made using vintage book pages. They would look lovely hung on a rustic string a la bunting or garland style. Handmade by Bookity on Folksy. Stay warm and safe perhaps by the fire with a good book!